The ideal companion to developing the essential skills needed to undertake the core module of English Legal System as part of undergraduate study of law or a qualifying GDL/CPE conversion course. Providing support for learning and revision throughout, the key skills are demonstrated in the context of the core topics of study with expertly written example sets of notes, followed by opportunities to learn and test your knowledge by creating and maintaining your own summaries of the key points. The chapters are reinforced with a series of workpoints to test your analytical, communication and organisational skills; checkpoints, to test recall of the essential facts; and research points, to practice self-study and to gain familiarity with legal sources. "Course Notes: the English Legal System" is designed for those keen to succeed in examinations and assessments with view to taking you one step further towards the development of the professional skills required for your later career. In addition, concepts are set out both verbally and in diagrammatic form for clarity, and the essential case law is displayed in a series of straightforward and indisposable tables illustrating how best to analyse and compare legal points as expressed by the opinions of the authorities in each case. To check your answers to questions examples are provided online along with sample essay plans and web links to useful web sites and sources at www.unlockingthelaw.co.uk, making this the ideal resource to guide you through the demands of compiling and revising the information you will need for your exams. 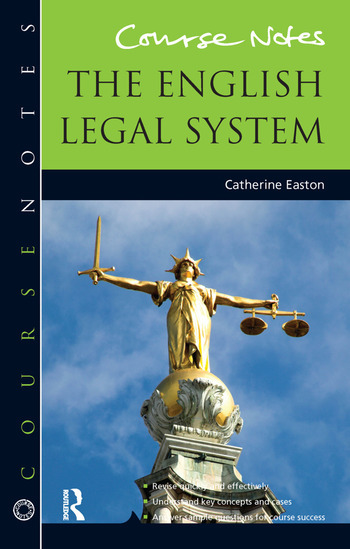 Dr Catherine Easton is a Senior Lecturer in Law at Manchester Metropolitan University. She teaches English Legal System on LLB and GDipL courses in the UK and in Hong Kong. Her research interests include using interactive technology to teach law.